Day two in Vancouver started with another scrumptious breakfast. We then hopped in the car and headed through the city, across the Lions Gate Bridge, and up into the mountains, praying all the way that the cold, cloudy, rainy day would miraculously turn beautiful. 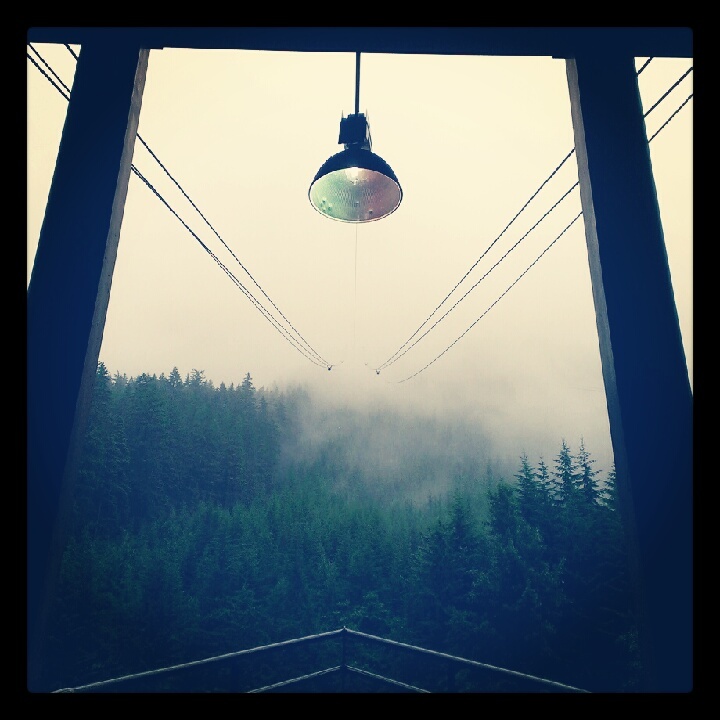 Our destination: Grouse Mountain and a day of hiking and zip-lining adventures! 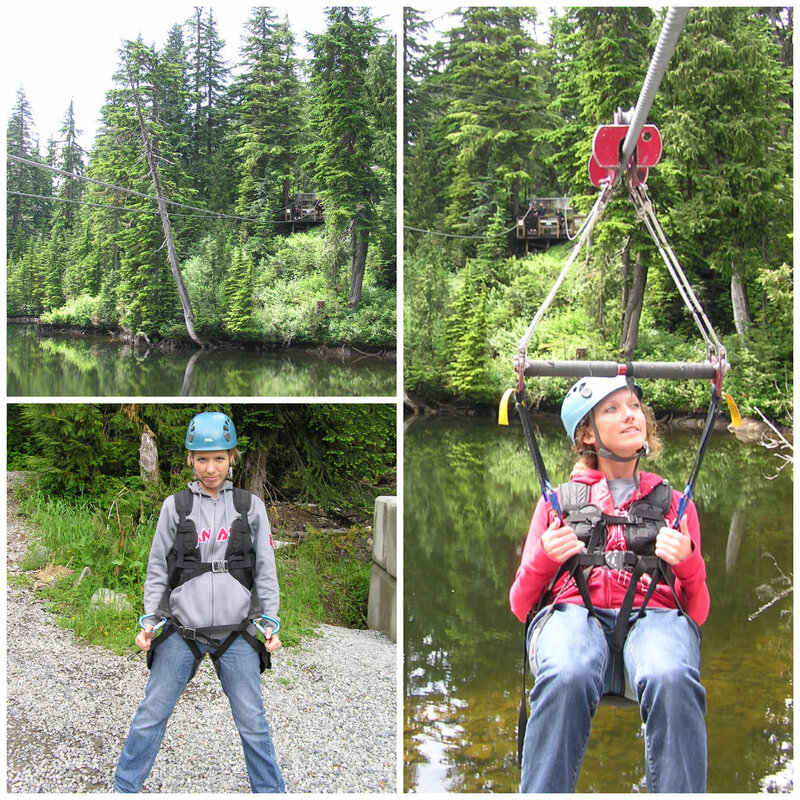 We had purchased passes and made reservations for zip lining the day before at the downtown Tourist Visitor Centre. We also saved a few dollars purchasing the passes here as opposed to buying them at Grouse Mountain. We parked at the base of the mountain and took the sky train up, up, up! 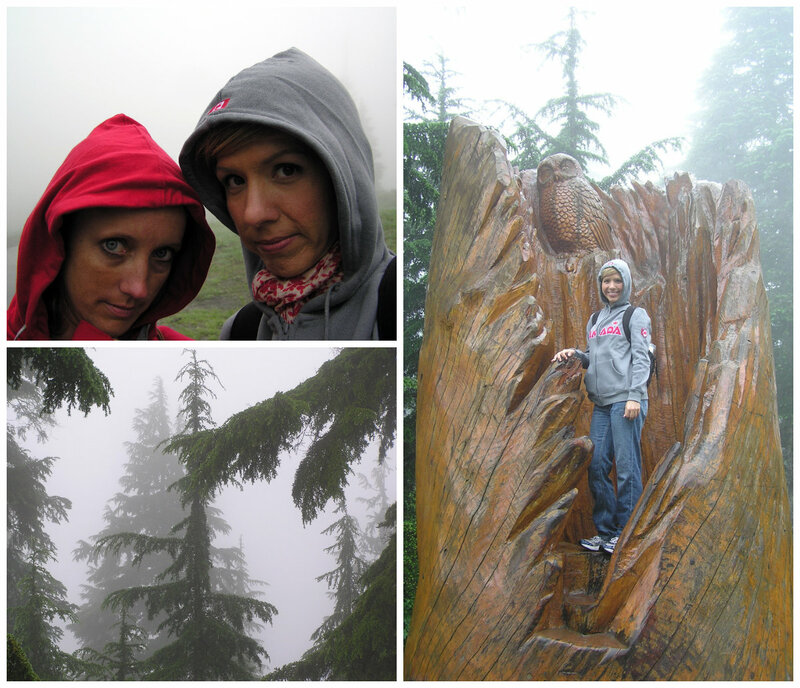 It was pretty cool – made even “cooler” by the fact that we were soaring up through the clouds and fog. Once on the mountain we started to explore. And by “explore” I mean try to find our way through the dense fog and not get lost or walk over the edge of a cliff (that would have been a genuine concern had there actually been any cliffs up there). It was so COLD and so FOGGY!!! We really just wandered around the paved paths, unable to see much around us. Our reservation for our zip-lining adventure was not until later in the afternoon so we were really hoping the cold, fog and rain would be a thing of the past by then. We stumbled upon two things at about the same time: the outdoor theater where the Lumberjack Show takes place, and the Beaver Tails shack. I was just a little bit more excited about one of these than the other (hint: it had to do with food). For those of you who have never heard of them, Beaver Tails are pastries that are shaped like, yes, the tail of a beaver and topped with various yummies like cinnamon-sugar, apples, strawberries and cream… my mouth is now watering. The first lumberjack show was starting in a few minutes so we decided to buy a couple Beaver Tails and some hot chocolate and wait for the show. Yum, yum, yum!! 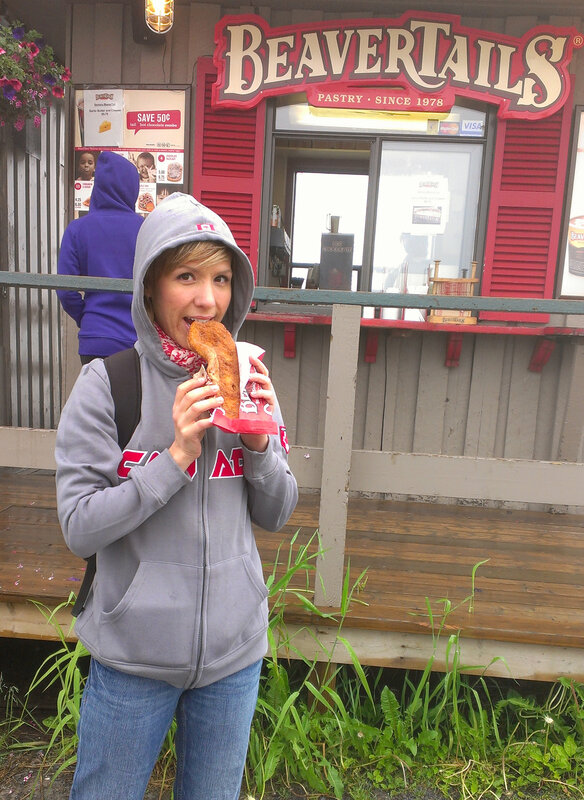 The Beaver Tail was delicious and the hot chocolate helped me to start thawing out a bit. Just a bit. The Lumberjack Show was…well, kind-of corny but I think that was intentional. However it was entertaining watching what these two guys could do with an axe and a chainsaw. 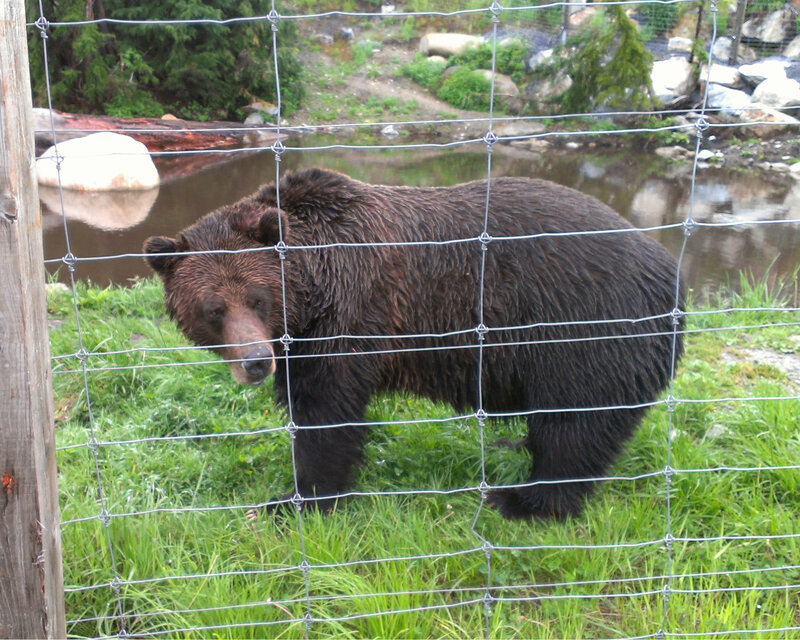 After the 45-minute show we walked to the grizzly bear sanctuary where we actually saw one of the bears! I was pretty excited and took way too many pictures and ridiculously long video of the bear doing…pretty much nothing. 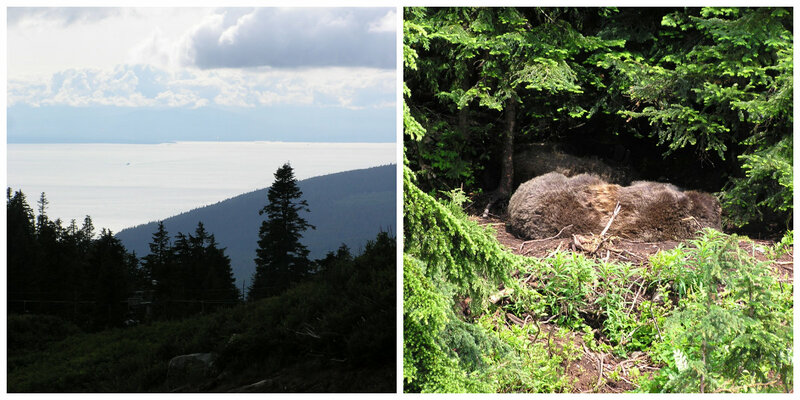 But hey – I can now say I’ve seen a grizzly bear! It was smaller than I thought it would be but I’m sure there are much bigger ones out there. At this point, we were trying not to get too excited about the fact that it seemed to be getting a bit warmer and possibly not quite so foggy. It had also stopped drizzling. Could it be? Would this turn out to be a beautiful day after all?? We walked around some more, taking pictures of the now clearing views and then headed to the chalet for a quick lunch before our zip-lining. We ate at the cafeteria and both had very over-priced and somewhat disappointing soups. On to the highlight of our day! We arrived at the Flight Centre and started gearing up. There were about eight people in our group plus two guides. Teresa and I had decided to go with the pricier but oh-so-worth-it 5-Line Adventure. They also offer a 3-Line Adventure but honestly, the last two lines were the best ones and well worth the extra money. The third line was fun because it crossed over water in a very pretty setting. After this one, those in our group who were only doing the three lines left and the rest of us headed to the chair lifts for a trip up to Dam Mountain. 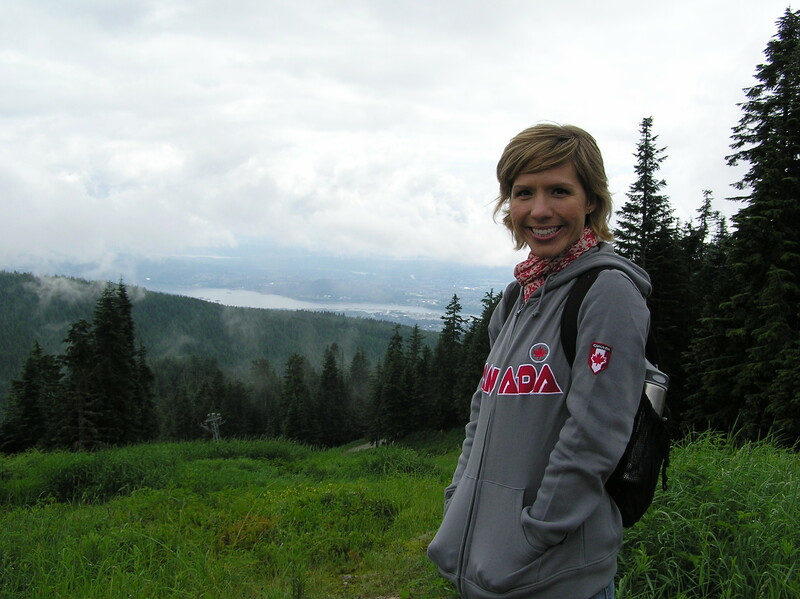 The ride up the mountain was so beautiful and peaceful – you could see for miles (and see the grizzlies sleeping below us). 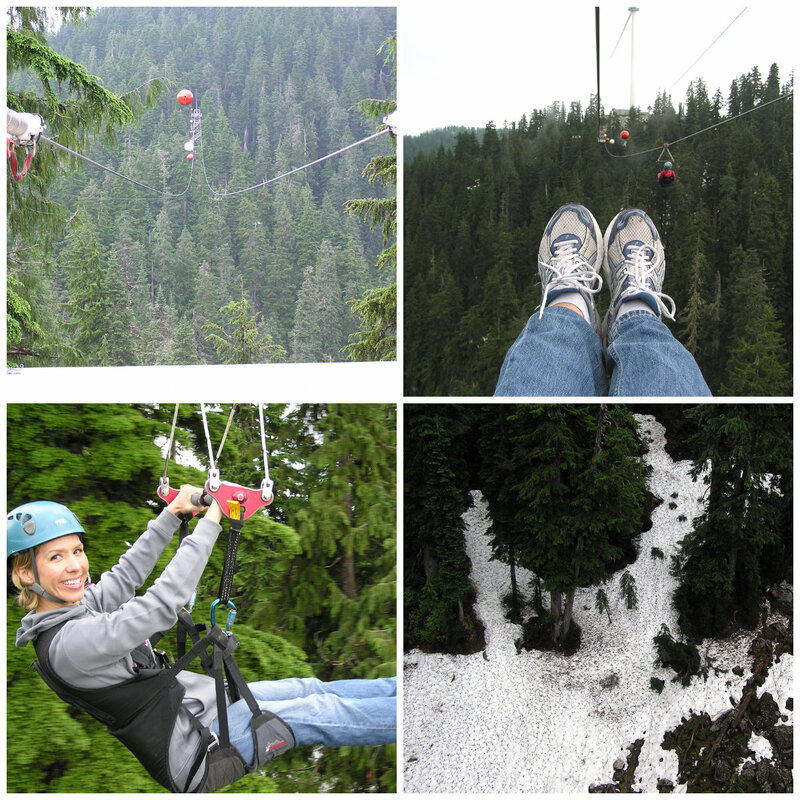 The next two lines were the longest and highest (200 ft) and the beauty that surrounded us was just amazing! I could have zipped across another five lines! 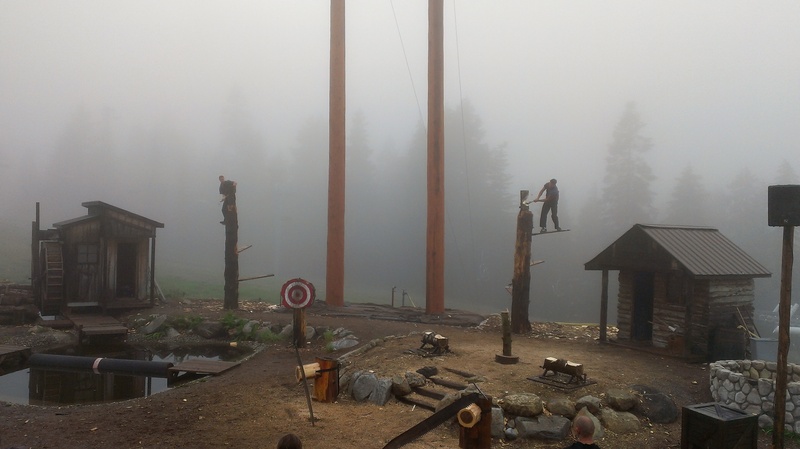 This adventure was so much fun and I am SO glad we decided to “splurge” on it! Our passes included a trip up the Eye of the Wind, the world’s first and only wind turbine that allows you to stand in a clear glass viewPOD at the top of the tower. It sounds a lot more exciting than it actually was but since it was free, we went up. Instead of taking the chair lift back down the mountain, we decided to hike down using what I assume is probably a ski trail during the winter. Ignoring the warning signs 🙂 we started our hike. So much beauty! I just love being surrounded by nature! Back at the chalet, and seeing the massive line for the sky train, we decided that we should go ahead and get in line for the ride back down to the parking lot since we were on a bit of a time schedule. Using our lovely GPS (borrowed from a friend before our trip), we easily found our way to the Malkin Bowl, home to the Theatre Under the Stars where we had tickets to see The Music Man. Before heading to Grouse Mountain this morning, we had stopped by the Vancouver Visitor Centre and purchased half-price tickets for the show. First things first though, and that would be dinner! There was a restaurant by the theatre called Stanley’s Park Bar and Grill and strictly based on convenience, we decided to eat there. 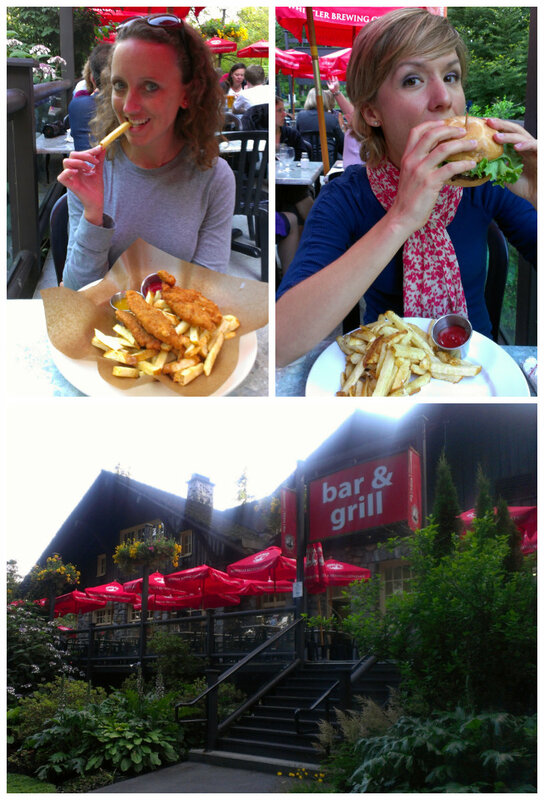 We ate on the patio overlooking the beautiful gardens and I enjoyed a yummy veggie burger and fries while Teresa had chicken strips and fries (we do love our French fries!). We had some time after dinner before the show started so we walked through some of the gardens and enjoyed the peace and quiet. 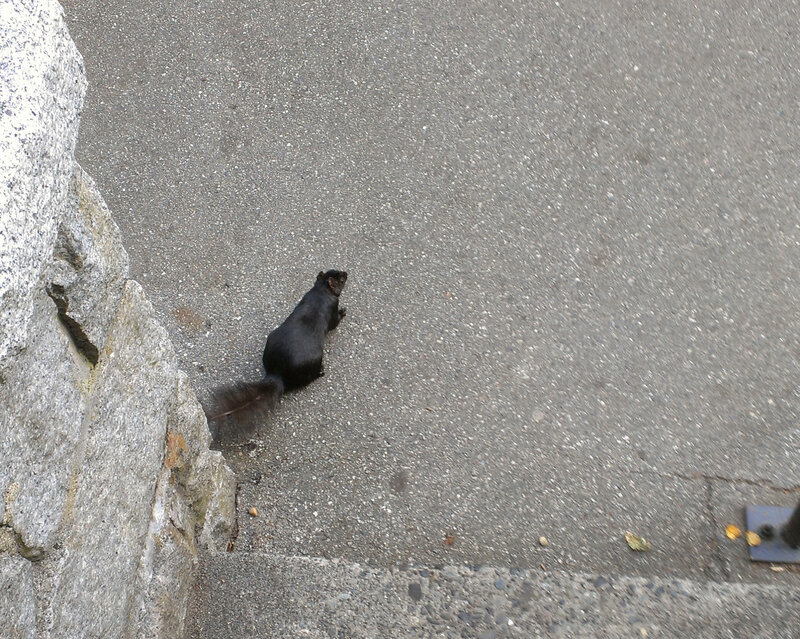 I also saw my second purplish-black squirrel! Has anyone ever seen anything like this? I was so intrigued! 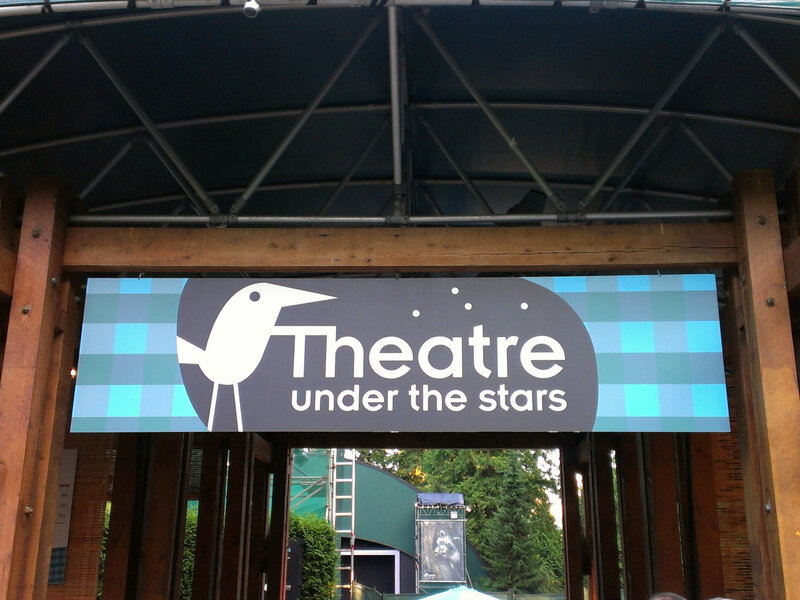 Stanley Park plays host to the Theatre Under the Stars every summer. 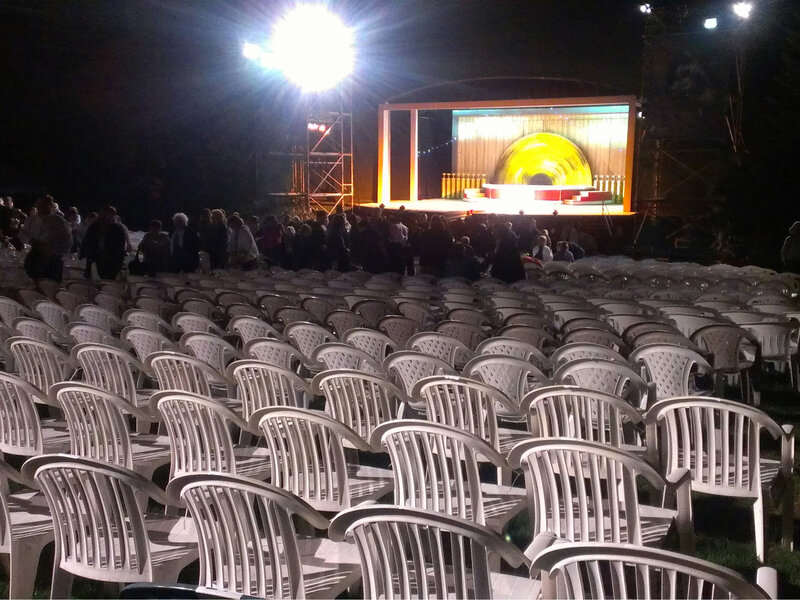 We found our seats (plastic lawn chairs) and waited for the show to start. What a FANTASTIC performance! I had never seen The Music Man performed on stage before and I don’t think it could have been any better! I was truly amazed at not only the talent but the set and the scope of the presentation! I think my expectations were kind-of low going in so I was very pleasantly surprised that I enjoyed it so much. A word of advice: should you find yourself in the fortunate position of enjoying a performance at Theatre Under the Stars (or any outdoor theater), make sure you bring warm clothes for after the sun goes down and insect repellent!!! Seriously. It will make your experience so much more enjoyable. I tell you this from unfortunate experience (I swear I was bit by a mutant mosquito). A late night out ended a beyond wonderful day!